12 August 2007. On the flight from Cape Town to Johannesburg we jammed ourselves into Mango Airlines' sardine can, and were sorry we didn't take a 1time Johannesburg flight. We don't always fly with the same airline both ways, as it's often cheaper to get onto a different airline for the way back. This was the case, and we flew 1Time airlines back. 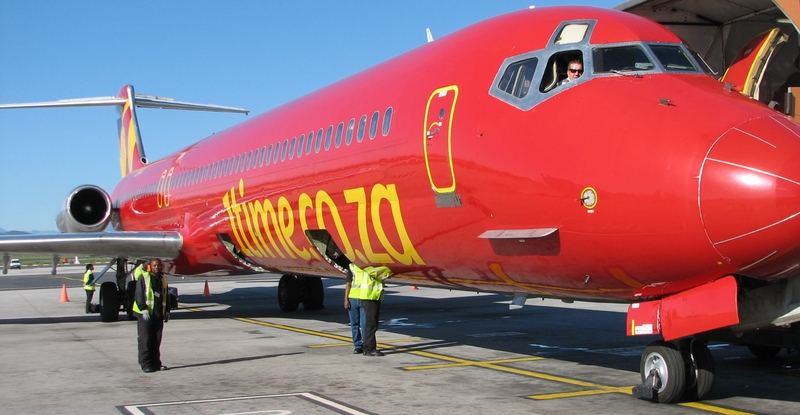 The 1Time flight from Joburg to Cape Town came to R1178 for the two of us (or R589 per person). These aren't the greatest flight prices, but the flights were on a Sunday and we were picky about the times we wanted to fly - we took flight 1T109 from Joburg to Cape Town leaving on the 12th August 2007 at 1250. Seated us on a 2-seater on seeing that we had a little one with us (on previous flight booked out the middle seat on a 3-seater for us). Allowed us to board just after the disabled. No queue-jump offer for mothers with children. More spacious than Mango Airlines. Crammed in, extremely uncomfortable if person in front folds their seat back. Baby's white cloth was filthy after lying against the side of the armrest. We each had a 1Time magazine. We're happy to report that 1Time Airline's check-in queues were far shorter than on the Mango flight from Cape Town to Johannesburg. Plus, the nice fella at the 1Time Airline check-in spotted our little one and said he'd check us in in a row with 2 seats - this offers way more privacy than a three-seater (especially important when you're breast-feeding). Thank you God for cheap 1Time flights. 1Time Airline allowed the disabled to board the plane first, and then babies and parents to board thereafter. There was noticably more space available on the 1Time flight. On boarding we renewed our vow not to fly Mango Airlines again, even if it meant paying R100 more to fly on a different South African low-cost carrier. When you've got a baby with you, the air hostess will come and give you a special talk - e.g. tie your seatbelt around only yourself, not around the baby. The air hostess mentioned that "...when the oxygen masks fall down...", we hoped she meant "...if the oxygen masks fall..."! We spotted the Mayor of Cape Town and leader of the opposition, Helen Zille, at Johannesburg Airport (at the Nescafe shop) - she didn't notice us! We saw Helen again at the arrivals hall in Cape Town International, waiting for her luggage at the British Airways carousel. Good choice of airline - we've for some time thought that British Airways has the edge over SAA.